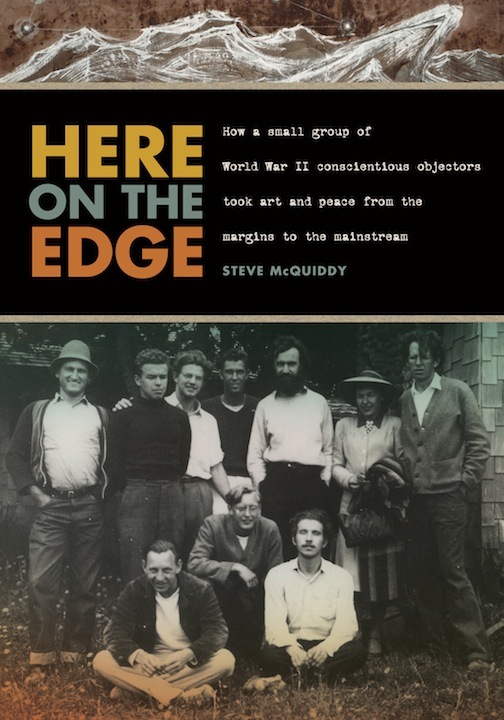 Here on the Edge is the long-awaited story of how a small group of World War II conscientious objectors on the Oregon Coast plowed the ground for a generation of social and cultural revolution. Twenty years in the making and packed with original research and more than eighty photographs, this definitive history of the Fine Arts Group at Waldport is available from Oregon State University Press. Here on the Edge answers the growing interest in a long-neglected element of World War II history: the role of pacifism and conscientious objection in what is often called “The Good War.” It focuses on one camp situated on the rain-soaked Oregon coast, Civilian Public Service (CPS) Camp #56. As home to the Fine Arts Group at Waldport, the camp became a center of activity for artists and writers from across the country who chose to take a condition of penance (compulsive labor for refusing to serve in the military) and put it to constructive ends. In the daylight hours, they worked six days a week—planting trees, crushing rock, building roads, chopping wood and fighting forest fires—for no pay, just room and board. At night, they published books, pamphlets, periodicals, and broadsides under the imprint of the Untide Press. They produced plays, art, and music—all during their limited non-work hours, with little money and resources. Perhaps most remarkable is the amount of sheer talent gathered in this tiny group, a number of whom went on to significant achievement in their fields: poet William Everson, who became Brother Antoninus the “Beat Friar”; Broadus Erle, violinist and founder of the New Music Quartet; Adrian Wilson, fine arts printer and recipient of a MacArthur “Genius Grant”; Kermit Sheets, founder of Centaur Press and San Francisco’s Interplayers theater group; architect Kemper Nomland, Jr.; William Eshelman, president of the Scarecrow Press, and internationally renowned sculptor Clayton James. Other notables published by or involved with the Fine Arts Group include artist Morris Graves, poet William Stafford, fiery antiwar poet Kenneth Patchen, and iconoclastic author Henry Miller. An even deeper current runs here. Not only were members of the Fine Arts Group and Camp #56 carving an unpopular path during the dark days of the 1940s, they were showing the way for the next generation, when a new set of young people, facing a war of their own in Vietnam, would populate the massive peace movements of the 1960s. Here on the Edge places Camp #56 and the Fine Arts Group in the context of conscientious objection in America, the World War II era, and the influence camp members had on the decades that followed. It serves as an introduction, an exploration, a narrative, a history, and, ultimately, a human story. It brings together, finally under one cover, the record of the fascinating members of Camp #56 and the Fine Arts Group, and how their legacy of art and peace resonated far beyond the borders of an isolated work camp in the far corner of the country. Be sure to buy this book from your local independent bookseller. If you’re not sure where to go, try this finding aid from IndieBound. Grateful recognition is given to the individuals and institutions who have granted permission to reproduce materials on this site. Wherever possible, credit is cited on the page or linked to the image. Otherwise, the item is identifed and credit recorded here. Detail from portrait of Glen Coffield, by Kemper Nomland, Jr. Image courtesy of Lewis & Clark College Special Collections. Detail from group photograph of Camp #56 members. Image courtesy of Brethren Historical Library and Archives. Detail from photograph of Camp #56 in winter. Image courtesy of Brethren Historical Library and Archives. Thanks so much for writing this important book. I’m in the middle of it right now and am fascinated. It’s a story I partly know, because my father in law was in Camp 56. Thought you might be interested to know that I have the Kelsey press on which some of the early materials were printed. Chuck Davis is still alive and kicking, and very happy with the book. Sadly, so many men didn’t live long enough to be recognized for their courage and talents during WWII. I just ordered the book… my mother owns a fascinating round stone house that was built by Earl Kosbab and his wife Eloise in the 1950s and early 60s in Ford River, Michigan. She purchased the home after Earl passed away (Eloise died several years earlier) and it was fully furnished, including their books, scrapbooks, and many photographs. Though we didn’t know the Kosbabs in life, we toast to them at every family meal in “their” home, and feel a strong connection to them. I am so thrilled to read about the shared experiences of the men in Camp 56. I would love to know more about the house you live in! My husband is actually related to Earl Kosbab (grand nephew), but we live in Georgia and can’t see the house. Is he in the book? I’d buy the book in a heartbeat if I knew he was listed! The book is fascinating, and though Earl is only mentioned a couple of times, it left me with a sense of understanding of what his experience in the camp must have been like, as well as the type of person he must have been, given the vivid descriptions of his friends and fellow COs in the camp. All indications from Earl and Eloise’s belongings and books are that they were creative and forward-thinking folks. I wear a ring of Eloise’s as my wedding band, and had a matching one made from my parents’ rings for my husband. Message me on Facebook and I can send you some photos of the house if you’d like! My sister and brother-in-law are currently living there. Steve McQuiddy, you have written a masterpiece. Even without my personal connection to this story, this book would be among my favorites of all time. I don’t even know where to begin in explaining how this history, and the way you tie it all together, has affected me… but this is one of the rare books that I have been unable to put down, yet read very slowly on purpose, because it transported me to a place where I long to be. Thank you for recording this important piece of American history. Mr. McQuiddy, this book is a masterpiece and truly worthy of the Pulitzer Prize. Excellent work, thank you so much!